Vinnichenko Maxim Ya. 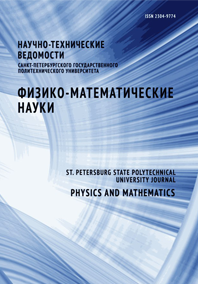 Firsov Dmitry A. Vorobjev Leonid E. Tonkikh Alexander A. Anikeeva Maria S.
The polarization absorption spectra of the Ge/Si quantum dot structures with different doping levels under the photoexcitation of nonequilibrium charge carriers have been investigated. The dependence of the optical absorption coefficient of the holes related to the transitions from the ground state of the quantum dots to the states of continuous spectrum was investigated as a function of dopant concentration. The experimental results were explained using a theoretical calculation of the hole energy spectrum in the framework of the quantum box model.